I bought Pepper one of those puzzle bowls to force her to slow down. She inhales her food as if she hasn't been fed in days. And then tries to take Ollie's food from him. Thankfully, this bright blue feeding bowl has solved those issues. Every time she eats, she goes round and round, trying to gobble up every last bite of dog food. 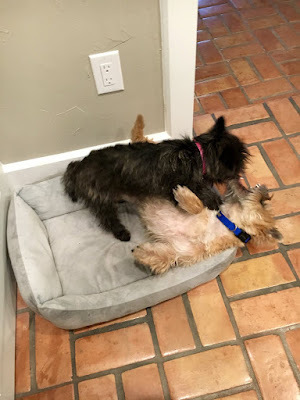 Rasslin' is still a favorite activity several times a day, especially since the backyard is a work zone and won't be dog friendly for another month. So they chase each other around the house and put on a canine WWE show for my entertainment. 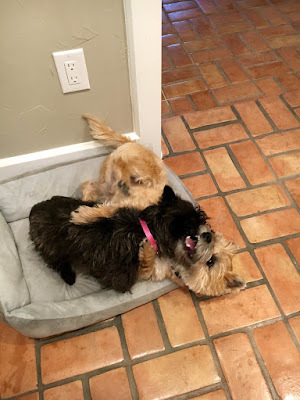 Here they are in one of the beds on either side of my desk chair this morning, being (relatively) good doggies with their morning playtime.